The kings (obas) of the Benin Kingdom and the high-ranking chiefs who served them displayed ivory tusks on altars to honor their ancestors. This tusk was commissioned by Ekeneza in 1775, the year he became ezomo, or military commander, under King Akengbuda (r. 1750–1804). The size of the tusk and complexity of the images, meant to be read from bottom to top, rival altar tusks created for an oba. 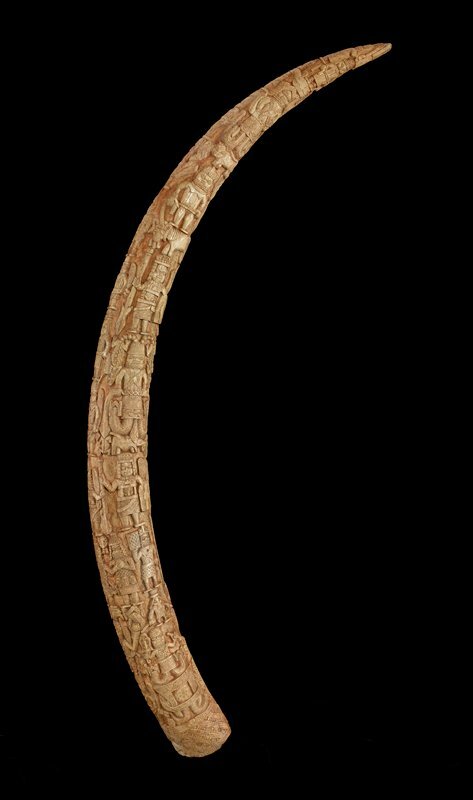 The intricate carvings that cover the entire surface of the tusk were accomplished by several members of the royal ivory-carvers’ guild, who used small tools to chip, smooth, and scrape away ivory. Motifs include deified kings, courtly women, and important commanders from the past; Portuguese soldiers, identified by their skirts, long hair, and beards; and leopards, elephants, reptiles, and mudfish—all symbolic animals in Benin imagery.